Kalinga War - Up until this point on the Indian timeline, no single kingdom had managed to dominate the subcontinent in about 2300 years of history. That changed around 322 B.C. with the emergence of the Mauryan Empire. It was ruled by the Mauryan dynasty and originated from the eastern state of Magadha, which was one of the 16 Mahā-janapadas (or powerful realms of India). The empire was founded by Chandragupta Maurya who overthrew the state of Nanda in 322. But its greatest ruler was his grandson, Ashoka Maurya, later known as Ashoka the Great (more on him later). Early in his reign, around ca. 265 B.C., Ashoka invaded Kalinga on the eastern coast of India to bring it (back) into his empire. Before the rise of the Mauryan dynasty, Kalinga had been under the control of Magadha, but broke away at the time of the conquest of Nanda, and Ashoka wanted it back. Kalinga was an independent minded kingdom and may have been a republic at the time. Ashoka's grandfather, Chandragupta, tried to conquer Kalinga, but failed. Ashoka didn't. He fought the state in one of the bloodiest conflicts in ancient warfare. Kalinga offered very stiff resistance, but was just too small of a kingdom to withstand the Mauryan's overwhelming numbers. An estimated 100,000 Kalinga citizens were killed another 150,000 deported, and Ashoka lost tens of thousands of his own people. The Daya River was said to have turned red with blood from the dead. 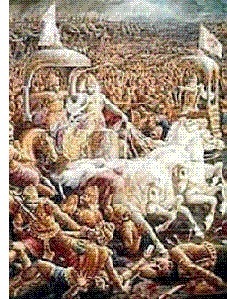 Ashoka saw the mass carnage firsthand and it is said to have had a profound affect on him. He became a devout Buddhist and vowed never to wage a war of aggression again. As a result, the Kalinga War is the only major conflict to occur during his reign. His vow is recorded in the Edicts of Ashoka.